The FieldEngineer.com platform is the simplest, most effective way to access freelance talent from across the globe. By using the platform, you will benefit from access to qualified, experienced freelancers capable of providing server deployment services on an on-demand basis, allowing your company to control its cost while still benefiting from the high-quality workmanship you need. By using FieldEngineer, you will have access to 40,000 engineers in over 180 countries, so you can access reliable server deployment services wherever you are in the world. The platform is easy to use and highly accessible; register for an account, post your work order, and then choose your server engineer, and schedule the start date for the work. What’s more, all of the engineers on the FieldEngineer platform complete full profiles and are fully background checked, so you can make your selection with total peace of mind. In addition to finding your engineers, you can also use the FieldEngineer platform to monitor the progress of your project. The platform allows you to track the location of your worker, complete work order management, accept mobile payments, and much more. The FieldEngineer platform is completely free to use and can handle a wide range of different jobs and requirements related to server deployment. 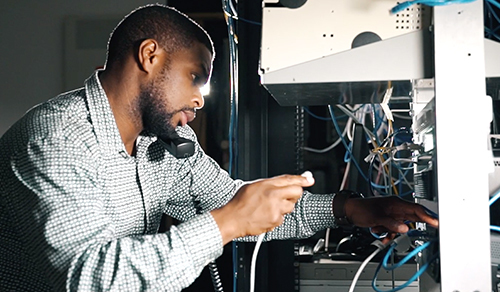 Whether you’re looking for a server engineer for work that needs completing at short notice, or multiple engineers for a long-term, complex project, FieldEngineer can help. Sign up today to post your work order and soon, you’ll be able to enjoy the multitude of benefits our reliable platform can provide.